Evan Ju and Warren Harper both pulled through in their final games of the Cadet Championship (Tampa, June 17-21) to tie for first with 7/10 in the prestigious National. 15-year-old Evan Ju is from New Jersey, and is coached by GM Joel Benjamin. Ju is slated to play on the New Jersey Knockouts in the U.S. Chess League this fall. Warren Harper is 16-years-old and hails from Houston, Texas. 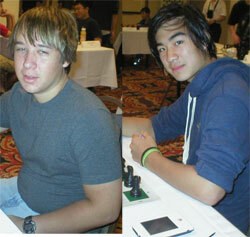 Both are ranked second in their age group on the June 2007 Top 100 rating lists. In the final round, Jeffrey Haskel played an unorthodox opening (1. Nf3, 2.c3 and 3.d3!) against Warren Harper. . The endgame looks slightly unpleasant for White (due to Black's control over the c-file and White's "bad" bishop), but should be drawish because of Black's weaker king and soft spot on e6. 27. h5 was a mistake, allowing Black to win a pawn with Qc1+ and Qh6, and not giving White enough compensation. Evan Ju's game against Alec Getz was an inspired effort. Evan won the two bishops and aggressively attempted to attack with ideas like Re8-e6. White had play all game though. Instead of 37.h3?, which led to a winning game for Black, Getz should have tried d6. Black can't take the pawn because it leaves the bishop on g4 loose. White is ready to jump in with Nd5 and earn some counterplay. The game continuation after 40....Be5! is a nice display of the superiority of a pair of bishops on an open board. Evan Ju heads the final crosstableon tiebreak. There was no playoff. Although the relevance of tiebreaks in a double round robin is not high, Evan should be very proud of his dominance in the early half of this event, and his recovery when things didn't go his way. Talk about fighting chess- Evan had ten decisive games! Robert Lau from Hawaii also deserves kudos for his 6.5/10. He rallied in the final three games to come in clear third, a full two and a half points ahead of fourth place. You can watch the final round of the U.S. Junior Championship on monroi.com. Ray Robson and Marc Arnold lead with 5.5/8 with a round to go. Look for the CLO report the morning of June 22 with more photos and games!